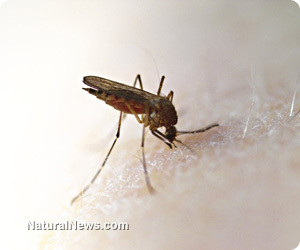 (NaturalNews) With summer in full swing and open-air activities beckoning, don't sacrifice health and well-being for toxic insect repellents. Instead, whip up a painless recipe or two that keep disease-carrying pests at bay. Pleasant, natural and effective, staying safe and comfortable throughout the season has never been easier. The next time you slather on a conventional insect spray or lotion, think about this: DEET (N,N-diethyl-m-toluamide)-based repellents have a long history of serious side effects. Developed in the 1940s, DEET is used to deter biting insects like mosquitoes, ticks, fleas, chiggers and black flies. Unfortunately, this protection comes at a cost. DEET is linked with behavioral changes and brain cell death in laboratory tests. Frequent and prolonged use impairs motor coordination, learning, memory and concentration. Muscle and join pain, headaches, fatigue as well as tremors and shortness of breath also occur. Considering approximately one-third of the U.S. population uses DEET-based products, safe alternatives are needed. As luck would have it, creating natural repellents is easier than you may think. With such a bounty of essential oils and safe ingredients available, there really isn't any excuse to place health at risk with harmful bug sprays. The following provides a bit of inspiration for fending off annoying summer insects naturally. Diet - Avoid salt and high potassium foods. Consume crushed raw garlic and 1-2 tablespoons of organic apple cider vinegar per day along with adequate vitamin B1. Clothing and personal products - Since dark and brightly colored clothing attract insects, opt for white and pale, neutral shades during summer. Artificially scented hair products, soaps, lotions and perfumes are also problematic. Herbs - A variety of culinary plants are helpful for warding off biting insects from outdoor spaces. Plant citronella, catnip and lemon balm near external doors and windows as well as around patios. Essential oils - Cedar, lemon eucalyptus, citronella, catnip, lavender, tea tree, lemongrass and cinnamon oils are excellent bug deterrents. A study at Iowa State University found the essential oil of catnip was approximately 10 times more potent at discouraging mosquitoes that DEET. Mix 20-25 drops per 2 tablespoons carrier oil like olive, coconut or sunflower and apply liberally to skin. Alternatively, add 2 teaspoons essential oil to 1 cup 190-proof grain alcohol. Transfer a portion to a small spray bottle and shake well before each application. For a bug repellent soap, combine 10-15 drops per ounce of liquid Castile soap and bathe with it before venturing outside. "Bug-off lotion bars" are another effective option. Using sumptuous ingredients like coconut, mango, shea or cocoa butter along with select herbs and essential oils, repelling insects is a surprisingly pleasurable affair. The complete recipe can be found here. If you are an insect magnet, cheer-up - there's no need to subject yourself to unpleasant chemical sprays or lotions. Simply fortify and defend with nature's cornucopia along with a few basic tips. And enjoy a happy, itch and disease free summer.